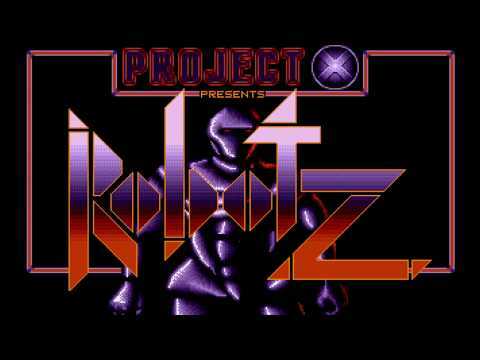 "Hi all, I made this little new year music demo because I always loved the music from outrun and I always felt that we Atari ST guys were cheated on. Firstly, there was a track missing. Secondly, it kept shifting between the two other tune every time one would die. Lastly, I do not think that David Whittaker did his best. The music files are YMT format running at 300hz and the reason the program file is so big. In the new year I will make a new sound format, still as fast, but be taking less space but you will need a 2mb Atari to run this. Thanks to everyone for listening and I hope you like this? Thanks, Peter." 2016 has been a fantastic year for the Atari ST/e platform. We've seen bucket loads of demos and games come out or begin development so let's hope 2017 brings many more goodies for us all to tinker with. Happy New Year!! 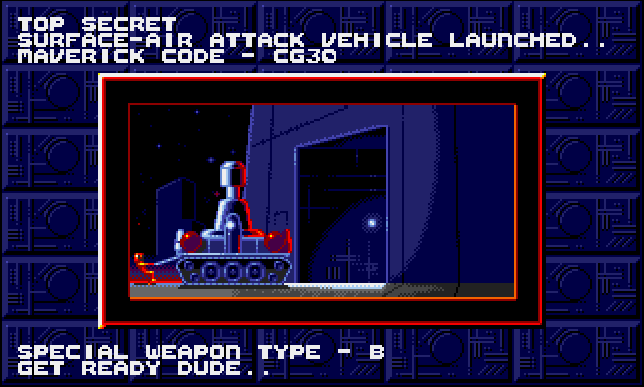 Droid is a platform-shooter released for the Atari ST in 1991 by the distinctively titled M.P. Lord. You are a robot mech who is apparently lost within a catacomb of well-armed caverns and the aim is simple: escape! It might look familiar but forget you saw that Psygnosis game as you explore and kill all the metallic baddies along your journey. 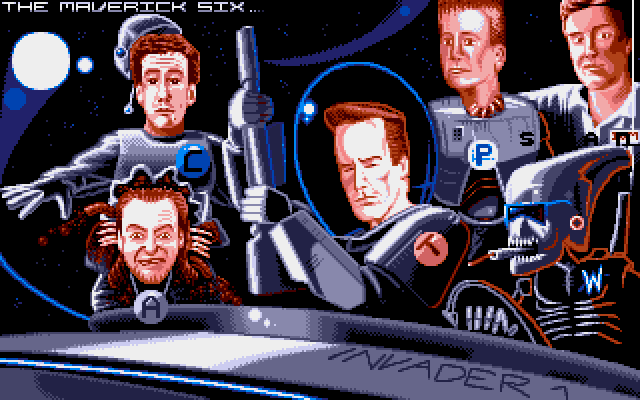 This was one of the most popular public domain games on the ST and even gave us a sequel released in 1994. However, neither game uses the enhanced hardware lurking within the Atari STe which was disappointing. Today, that changes because Jamie Hamshere is working on an upgraded game which will utilise the enhanced hardware to feature smooth 50fps hardware scrolling, Blitted sprites, and DMA sample sounds. The results are truly outstanding. You can download the early-beta release and have a play yourself. Please remember that this is unfinished and he still has much more hard work left to do. However, it's a tremendous improvement over the original which was already an incredible game. I wish Jamie well with his piece of STe magic ... watch this space, folks!! It's got to that time again where I search for something Christmassy and SantaFly by the awesome Reservoir Gods was the best choice this year. Regular readers will remember I have previously featured its sister game but don't get the two titles confused, even if they are basically the same idea! Yes, SantaFly is every bit as frustratingly addictive but with a peculiar and silly Christmassy theme. It's great fun and I advise you clickety click and download it. 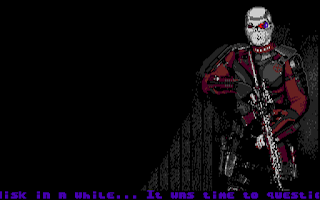 Artemis, by Ralf Hemsing is a Z80 / ZX Spectrum emulator. There are numerous configuration options for the technically minded but sticking with the defaults seem to work well. Her performance is more than acceptable but there sadly appears to be no support for colour. Which isn't too big a deal, who had a colour TV in their bedroom back in 1983 anyhow? ;o) One game is included and it's a good one, Jetpac! Strangely, this isn't a snapshot but instead something I've not heard of before, a ".PRO" file. Can anyone please help me locate other games in this format? 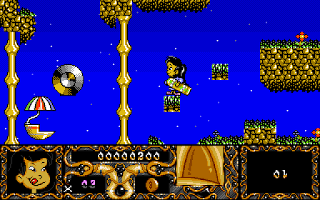 Artemis comes with no docs, lacks colour and doesn't seem to like any computer faster than an Atari ST/e. 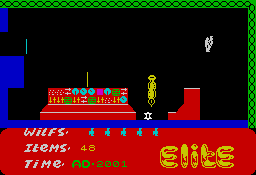 But it's always great to discover "new" software and, whilst it might not come close to beating the Speccy emulator, it did run Jetpac far better than I imagined and it certainly offers great #geek appeal for my fellow ST nutters! Enjoy. 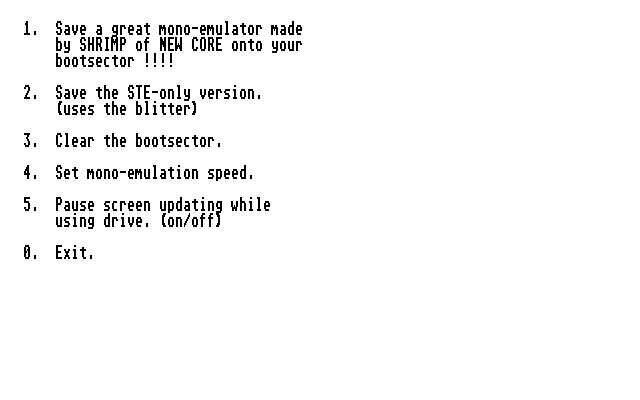 - Floppyshop has the download on disk "UTL-3025" which also features Speccy! Unheart is one such title I've been meaning to feature for far too long. It's actually quite new and was only released in 2014 at Silly Venture by Masters of Electric City. Based on the original PC game, Heartlight which happily mixes Sokoban with a dollop of Boulder Dash to produce a riveting and refreshing brain teasing challenge. Hitting the ESC key causes our dwarf to humorously explode so we can restart the level. Also featured is a level-skip function which allows us to bypass mind-destroying levels with the option of coming back to them later (yeah right). The graphics are simple yet superbly detailed with a gorgeous palette. The status bar displayed in overscan, which is always going to be a great thing for the obvious reasons. Now, the music is totally breathtaking and suits the game perfectly. But why aren't there more? Boulder Dash fans should look elsewhere because this is a Sokoban game and a brilliant take on the idea too. The difficulty generally remains a constant throughout - high - with cunning map designs causing the most intense problems to overcome. Thankfully, with unlimited retries and the ability to skip troublesome levels, this is a game you will keep on coming back to. Unheart is a challenging and distinctively brilliant puzzler. One of the beST. - A download is available from Demozoo which also links into Silly Venture and more! 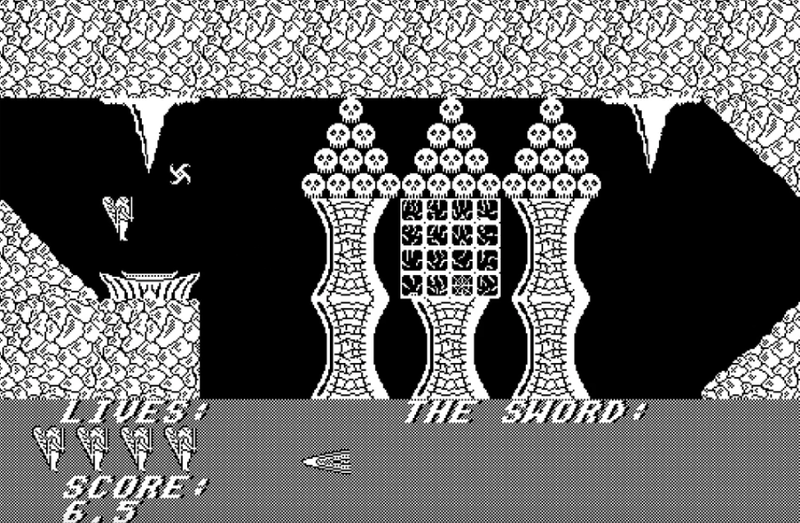 Anduril is a high-resolution PD game by Markus Dheus from all the way back in 1986 and features a winged hero stuck inside a 2D world of object collecting. 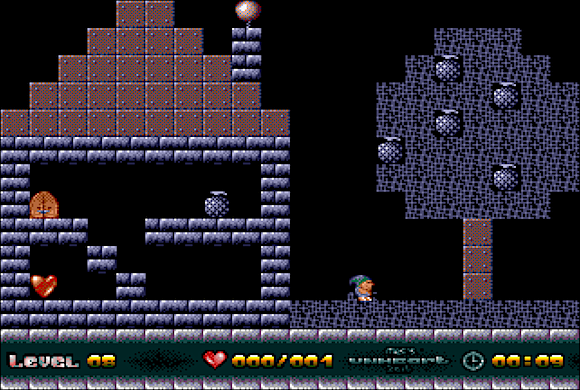 Like the ZX Spectrum game, Kokotoni Wilf, this is also a flick-screen platformer with many cunning rooms for us to explore on our item-collecting journey. Unfortunately, unlike Kokotoni Wilf, our hero cannot walk nor even touch the landscape scenery as it results in an instant loss of a life... Thankfully, he can fly like a flappy bird using simple controls: use the SHIFT key to fly with H + J turning you left or right. I imagine Anduril is beginning to sound rather easy? You couldn't be more wrong and anyone that loves a challenge will certainly get that. The first couple of screens are easy but it isn't too long before the game's true sadistic nature is exposed. Most of the map is made up of incredibly tight spaces with which to guide our hero. If that wasn't tough enough, once gravity is factored in, Anduril becomes a distressing adventure for all but the patient player. The colourful ZX Spectrum version of Kokotoni Wilf vs Anduril displayed using crisp Atari ST monochrome. The graphics are crisp and detailed but I noticed odd collision detection, which often worked in my favour so I shouldn't complain. Sadly, sounds are almost void with only a low-volume spot effect for an item pickup. However, I can live with the quirks if gameplay measures up and (after mastering its vicious learning curve) it does so, if you're willing to put in the time, Anduril is one seriously addictive game which I recommend - stick with it. 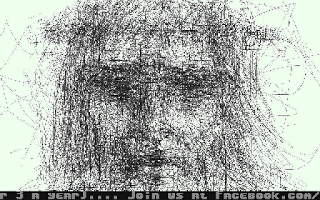 You can download Anduril from the AtariMania website and this program will help if you've no high-res monitor. 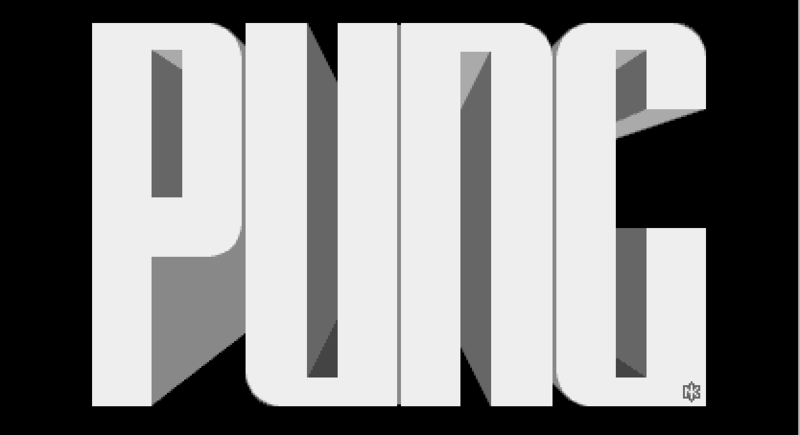 Pung is an old Atari STe game which has been released after years of lurking in software purgatory. It's obviously based upon the 1972 classic and currently stands at v0.30 which means it suffers a few bugs that might lead to those infamous bombs across your screen. Just reset and keep on playing! I'm glad this got a release as we have enjoyed playing it over the weekend - it's different with a few neat ideas and I recommend you take a look. - Demozoo website has a download with all the credits and more. - I nabbed the MOD music file off Demozoo and made a recording. Love it! 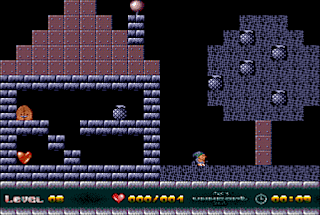 Here we have a cute platformer released in 1992 by Hi-Tec Software which is based on an old Hanna-Barbera cartoon (which I'd never heard off until today). Okay, so I've learned that Potsworth is a dog who happens to have a group of kiddy friends called The Midnight Patrol. Well, someone has stolen a sleep potion and conveniently placed the pieces within five silly worlds. So, now it's up to these kids to return it to the Grand Dozer, whatever that is!! This means we get to be each of these kiddy characters from the tv show. First up is a rather stroppy looking girl who's adventure oddly places her underground in a place that reminds me of Rick Dangerous. There are also numerous puzzles to solve along the way but don't worry yourself too much because rocket scientists need not apply. These simple puzzles might require dropping a heavy block (or teddy bear!) onto a switch... The tasks add a spark of interest which I thought was enjoyable. Each new level sees us change into a new character and I especially enjoyed the third where we are the dog in candy land as this is bursting with cool mechanics and is overall positively interesting to explore. The one thing which remains a constant throughout is the superb controls which are precise, responsive and never feel laggy. The visuals are also truly superb with fantastic locations, awesome sprites, and loads of colour with scrolling that is both fast and fluent. Audio is sadly the mirror opposite and appears to be nothing more than an afterthought with only a few spot effects and no background chiptune. The theme tune is even worse and should be skipped as quickly as is possible, just like in Alien World which is another humongous disaster of audio waste! 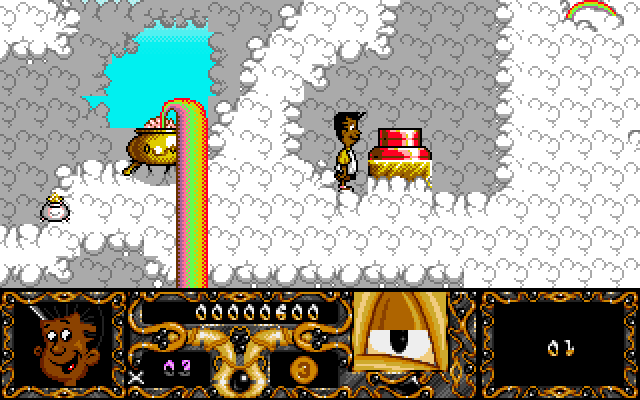 There might be a few frustrating quirks but I feel Potsworth & Co is one of the best platformers I've played on any computer and is also a testament to the power of the Atari ST. Get ready for an incredible venture through immensely interesting worlds and I'm sure all platformer fans will love this hidden GEM as much as I have. Superb game! 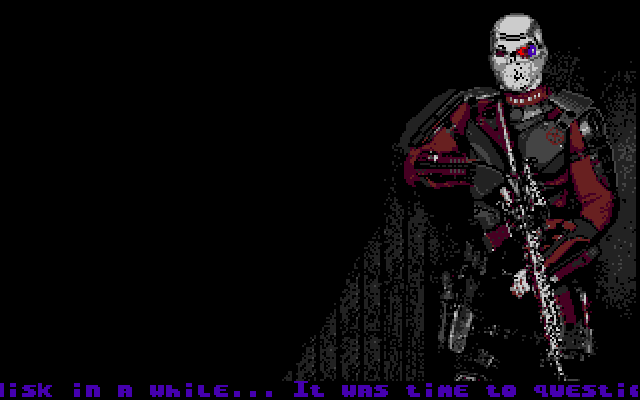 - Peter Putnik from 8BitChip is addicted to this game so why not try his hard disk version. - Those who require the floppy disk version should check out Old Games Finder. 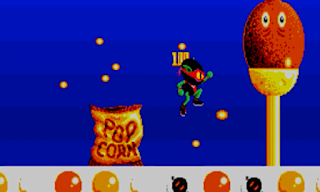 MonoPack was released by Shrimp of NewCore and allows the Atari ST (w/ colour display) to run in high-resolution mode without the need for an Atari or VGA monitor. Yes, there are already lots of programs that already offer this function but I think this is better because it saves itself onto the boot sector of a floppy disk. This means it's fast to activate and also has the option to use the Blitter coprocessor for fast rendering. What an excellent utility! Probably the best titled Atari ST game!! Not only that, but this is a fantastic game and one I featured about a year ago and found it to be one of the most frantically zany shooters I have played but just look at the a-m-a-z-i-n-g box art which is both colourful and comical. Yep, this is certainly one which I'm proud to have in my collection. How could anyone ever contemplate improving Space Invaders? How about supersizing it with lots of cool new ideas!! Which is exactly what Domark with the imaginatively titled Super Space Invaders, an authentic take on the original idea with an array of next-gen invaders to quench our two-dimensional alien-zapping thirst. From the start, we're treated to a superb intro which you should watch. 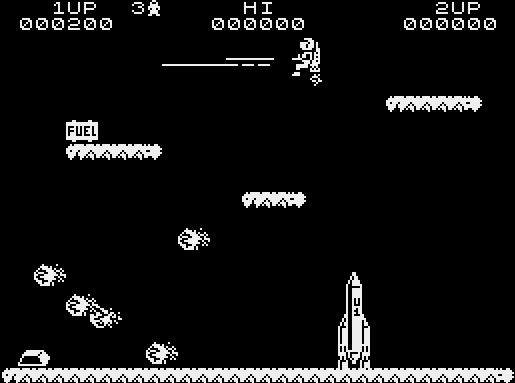 When the game begins, each stage is presented in groups, similar to Blasteroids offering a different path through with each wave starting slowly to gradually speed up with each kill. However, these new invaders attack as a wide variety of targets for our gun love - some will bloat after being shot, thus requiring extra effort for the kill. Don't expect the same attack formations, this time the aliens will use various styles with some breaking away - Galaxian style! The intro is legendary. I absolutely loved it and it's definitely something you don't skip!! 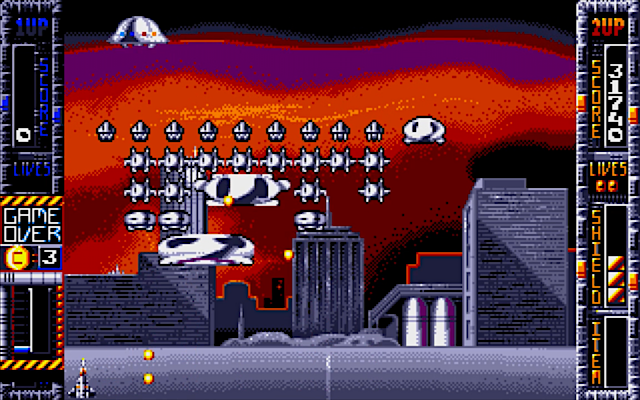 An easily-targeted mothership frequently passes by and, if destroyed, drops a handy power-up in true Arkanoid fashion. These power-ups make the entire experience something very special - I love the laser which slices through the alien hoard like a hot knife through butter but, I must admit, to taking a liking to that rapid-fire power-up. 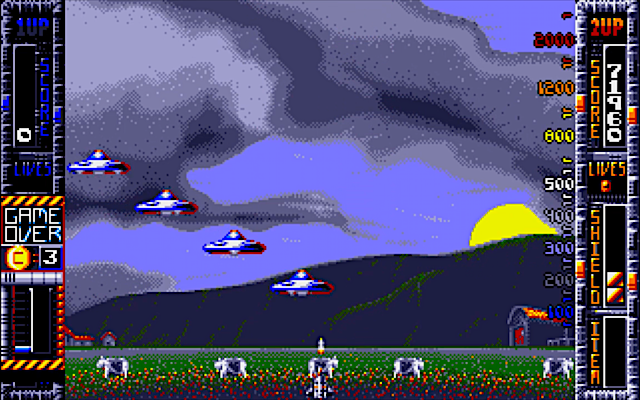 If Space Invaders ever had a flaw then it's gotta be repetition, but Super Space Invaders attempts to break that by introducing bonus rounds - flying saucers will invading the rural countryside abducting cattle, of all things. Finally, groovy end of level bosses are on guard and in urgent need of a good hiding - I am especially impressed by the boss after level three which I thought was beautifully animated. Woo!! Those alien pests balloon when they're hit. Protect your moo cows at all costs!! Throughout, the graphics are generally excellent with nicely detailed invaders and I especially liked the huge insects and End Of Level bosses - brilliant examples of cool pixel art. Audio is great, from that incredible intro video to the game itself. 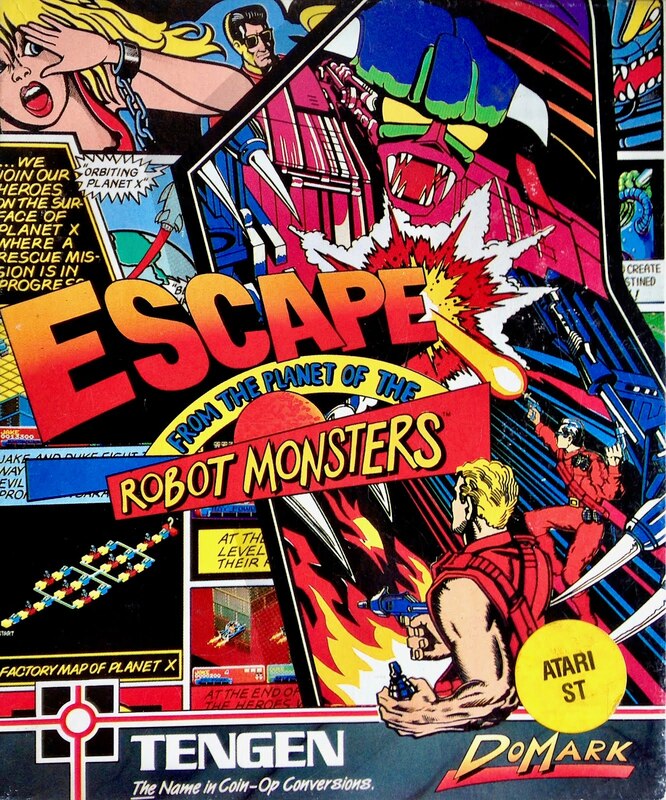 However, I was a little disappointed not to hear the famous cannon sound effect... Musically, very interesting and I was immediately reminded me of Escape From The Planet Of The Robot Monsters. I think purists will probably turn up their nose in disgust at this abomination. However, it is a great game in its own right and the use of power-ups transports what might have been a predictable clone into a freakishly fun game. Far more addictive than I first imagined and I love the game so much I bought myself a copy! 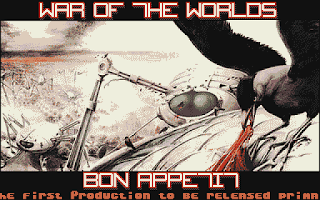 Boot up this game from hard disk or floppy if you dare protect humanity from the alien scumbags? 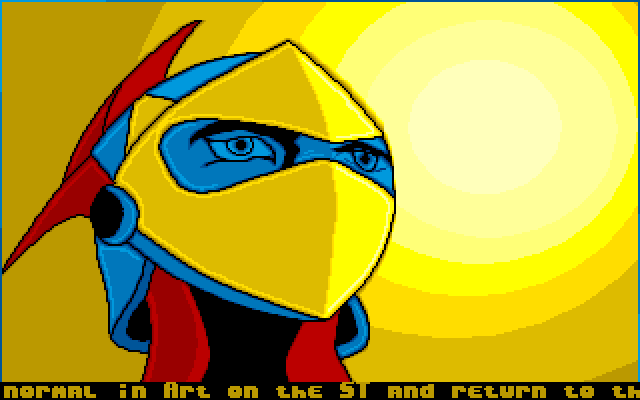 The Atari ST/e demoscene has entertained us with some incredible productions over the decades and, predictably, these are often by the same incredibly talented people which made our jaws drop back in the 80s or 90s. 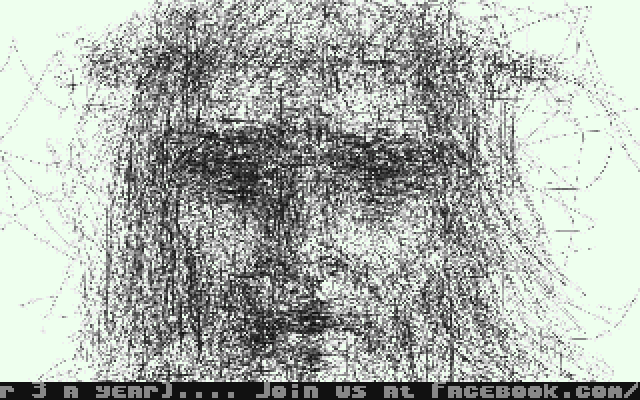 Collaboration One is different, this is a new slideshow of pixel art created by a brand new demogroup, STatariART. In fact, they only got together a few weeks ago with the notion to create a series of disks which will also be accompanied by chipmusic and a must-read lamer's scroller. 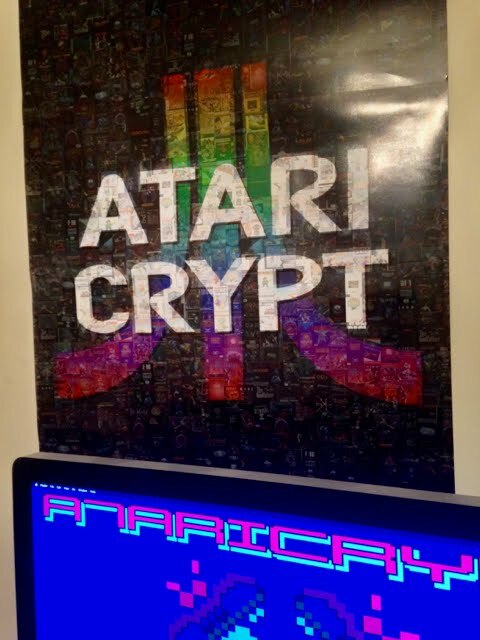 That's right, it's been 30+ years since the Atari ST was launched and yet it still manages to inspire people and bring them together so enjoy the STart of something great. - Clickety click to download STatariART's first release, Collaboration One! - STatariART are on Demozoo which lists their members and lots more. Today, I am extremely proud to announce the availability of AtariCrypt Magazine. 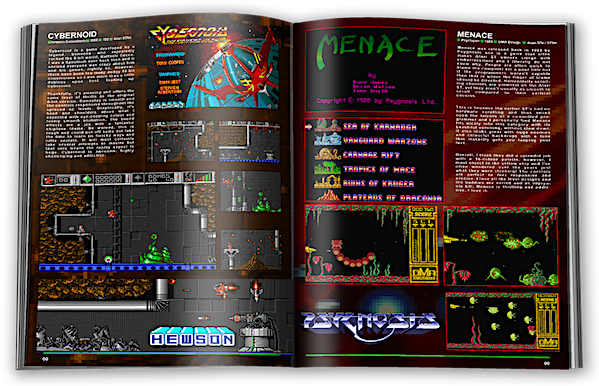 That's right folks, a brand new magazine STuffed to the brim full of 16-bit gaming goodness. It has been designed by none other than Darren Doyle and I'm sure you will appreciate his awesome, creative talent which promotes our reviews, interviews, etc. So the joy of Christmas has come early for the Atari ST gamer! Best of all, this magazine is a free download to simply say a Mega ST thank you for supporting my humble website over recent years. I hope you all enjoy flicking through the world's newest Atari ST magazine and here's to more retro gaming in 2017 and beyond - Merry Christmas! - Clickety Click and download AtariCrypt Magazine. Feel free to comment here and leave your feedback! - What? This isn't enough and you still want more? > How about a massive A1-sized poster for your bedroom!! > Power Without The Price. > View Darren Doyle's Atari ST magazines. Collecting the items is the name of the game and, in Sweet World, that means candy. Look at the bottom/left of your screen which displays how many are still required with an arrow pointing you in the right direction. Thankfully, there are restart points from which to continue your adventure but it will never be easy when each level has such a cruel layout of traps and a huge number of baddies. Controls are absolutely superb - intuitive and very responsive with the option to use inertia, which I personally leave disabled. Keep banging on that fire button for a rapid firepower onslaught and if you tap it again (during a jump) then a pirouette manoeuvre is actioned which rapidly kills anything dumb enough to get in your way. Power-ups are also frequently available to help ease your hectic adventure like Two Zool - your very own doppelganger. 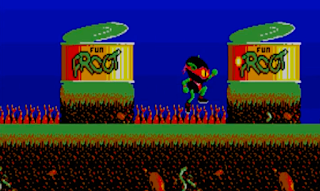 Like all ninjas, Zool has an energy shield which can be replenished during play but it can survive only three hits before you're as dead as a dodo. Don't forget to wear your sunglasses - this is one of the gaudiest games I have ever played and almost feels like they have utilised each and every colour. But, it works, and it works ever so beautifully with some of the most creative landscapes and sprites. In fact, the sprites are downright gorgeous and I love that purple dolly mixture. Atari STe users will be thrilled to witness more colours and everything scrolling along at an alarming 50fps. However, backgrounds are boring compared to similar titles and there is a little slowdown during some busier scenes. Audio is bang on superb and they've done a great job with both the sound effects and optional chiptunes. It would have been nice to hear DMA effects, especially noticeable in world two with the oddly silent musical instruments. There are too many deadly objects which are often offscreen and too easy to bump into but, ultimately, the constantly respawning baddies frustrated me the most. Whilst these definitely make for a busy adventurer they soon become a tiresome overkill. However, having said all this, I'm shocked to admit that I'm actually enjoying this imperfect platformer. 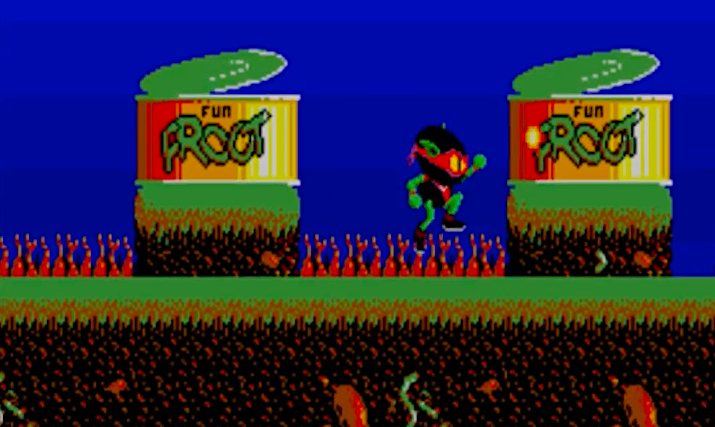 It is certainly stuffed full of action but if you're hoping Zool is our Sonic, you will be disappointed. Overall, a good platformer which is actually better than I remember. It should entertain you for several hours but I cannot recommend it unless you have an Atari STe. Now, for some peculiar reason, I feel an urge for Chupa Chups!! - 8BitChip always has the best download for those with the storage hardware. - For those stuck using floppy disks then Old Games Finder will ease your pain! - AtariMania not only feature Zool within their ST database website but also have the manual and code wheel! -> Spacebar 1 - will make you invincible. -> Spacebar 2 - to skip forward onto the next stage. -> Spacebar 3 - to skip forward onto the next world.